Brownie. 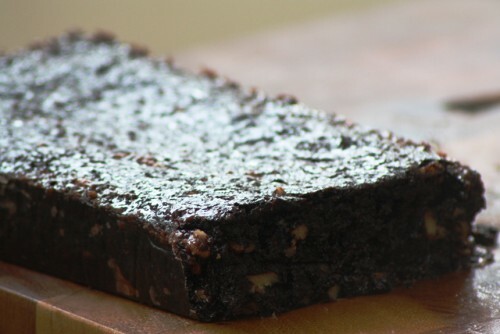 These contain nuts and produce a cake-like brownie with a dense crumb, shiny top and a deep, dark flavor. If gooey scoop brownies are more your taste, try the Decadent Fudge Brownies. 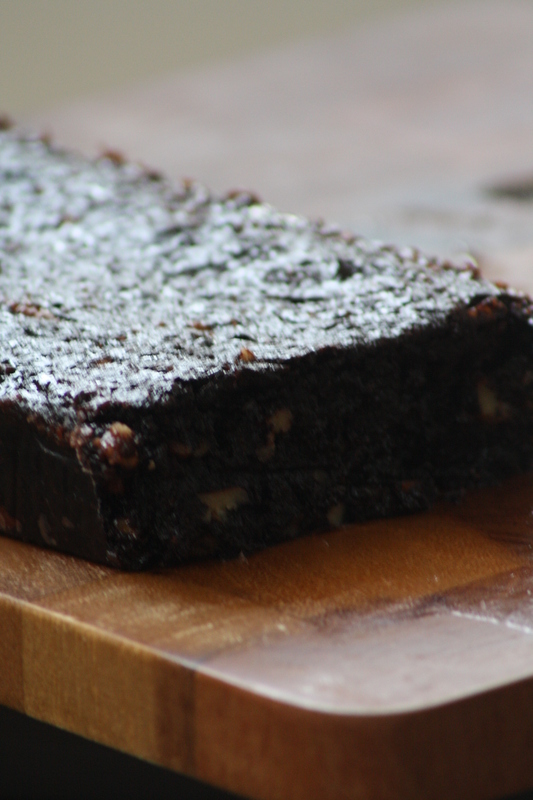 The Cocoa Almond brownies are easier to slice, freeze and serve well. Preheat oven to 325°F. Lightly butter or grease a metal baking dish and line bottom with wax paper. Melt butter in a small saucepan over low heat stirring regularly to prevent browning. Remove from the fire and stir in sugar, cocoa, vanilla, baking powder and salt. Stir well. Add eggs one at a time, whisking to blend thoroughly. Add powdered almonds and stir until combined. Sprinkle with sliced almonds and stir again lightly. Pour and then scrape all the batter into the greased and lined pan. Smack the pan against your countertop so the batter and almond pieces settles down evenly. Bake about 18-20 minutes until the top begins to shine and small cracks appear. Insert a toothpick into the center. 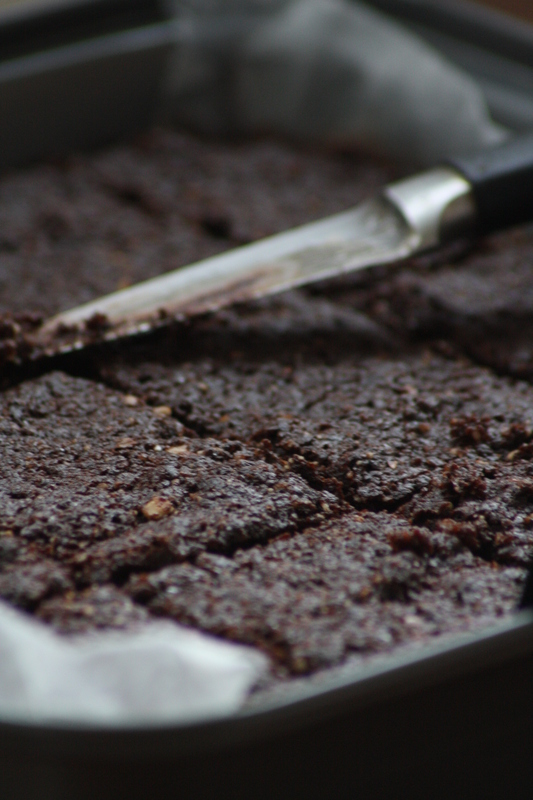 If the toothpick is slightly moist with crumbs and the batter does not ooze the brownies are ready. Do not over bake. Remove pan from the oven and let cool completely. Slice brownies with a sharp, smooth kitchen knife. Using a flat spatula gently remove from the pan. A flexible nylon spatula helps to remove brownies from a pan without damaging them. 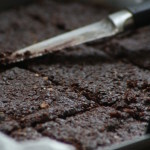 I use a non stick brownie pan, Chicago Metallic Slice Solutions Brownie Pan, 9-Inch by, 9-Inch by 2-Inch with a removable bottom that makes it easier to loosen and slice the brownies. To freeze these brownies, cool completely, then slice and freeze in a thick freezer bag or a freezer safe box. *Dutch cocoa is alkalized while regular cocoa is not. 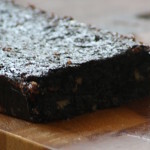 Since there are no leavening agents in these brownies you can use either with good results. Valrhona and Droste are good choices. If your cocoa is not the best quality add a 1⁄4 tsp of instant coffee powder to enhance the color.